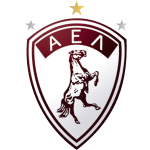 The club of Milos Deletic, Larissa, presently holds tenth position in Super League (Greece) and second position in group Gr. 8 of Greece Cup (Greece). The Serbian forward Milos Deletic joined his current team, Larissa (Greece), in July 2016. In terms of preferred feet, he is a left footer, like 46% of Larissa. He played 25 matches this season. Standing 1.79 meter high, Milos Deletic is tinier, when looking at the average height in his team. He is two years younger than than his team's average age, as he was born on 13.10.1993. While being substituted more out than in this season, we can observe that this trend came from last season. Moreover, he shows 40 out and 20 in substitutions in total. Apart from Milos Deletic, Dimitris Pinakas, Evangelos Nousios, Radomir Milosavljevic, Evgeniy Shikavka, Petar Kunic, Nikola Jakimovski, Gertin Hoxhalli, Fatjon Antoni and Marko Nunic are also forwards of Larissa. He weighs 74kg which is 2kg less than his team's average heftiness. In terms of top seasons, the Super League 17/18 (Greece) was his best one yet, breaking one personal record in terms of goals. Five months was the stubbiest period that Milos Deletic was contracted to a team (Acs FC Academica Clinceni from Romania) His squad concluded in a tie in 50% (40% home) in Super League and won 67% (100% home) in Greece Cup. The highest win streak of the last 5 matches happened in Super League with a count of 2. It's been 32 days since he played his latest match. Milos Deletic managed to attract a lot of good feedback after his performance at FK Radnik Surdulica, the team he was subjected to before joining Larissa. He is enjoying a great Super League 18/19 (Greece) season so far, netting six times (20.8% of his team's sum) and initializing two goals. This leads to roughly 0.08 assists and 0.24 scores per match in the resent season. One could say he translated to a slightly improved form compared to last year yielding a per-match-quota of 0.19 goals and 0 assists. He wears the number 11 strip at Larissa. Throughout his time as professional football player, Milos Deletic was sanctioned with a card 27 times resulting in a mean value of 3 cards per play time. This season he was given five yellow cards. His record stay with a club is his current one with two years and 10 months.